I left her a comment about my use of Google Maps so I thought I’d write more about it here. When I find an unfamiliar place name I go straight to Google Maps to find out where it is. I like to know things like if family members lived close together or, if they were living in a particular area, what their jobs might have been. I found the church in Scotland where my great grandparents were married and, as it’s still there today, could look at it in Google street view. Google Maps gives you the ability to save maps. They call it creating a map. You can bring up a map, give it a title and a description, choose whether you want it to be public or private and label places on the map using the Add A Placemark function. The blue pointers are the placemarks I’ve added to the map. Down the left hand side of the picture above you can see the labels I’ve given to my placemarks. When you’ve saved your map you can go back to it at any time by going to maps.google.com, logging into your Google account and clicking on My Places. 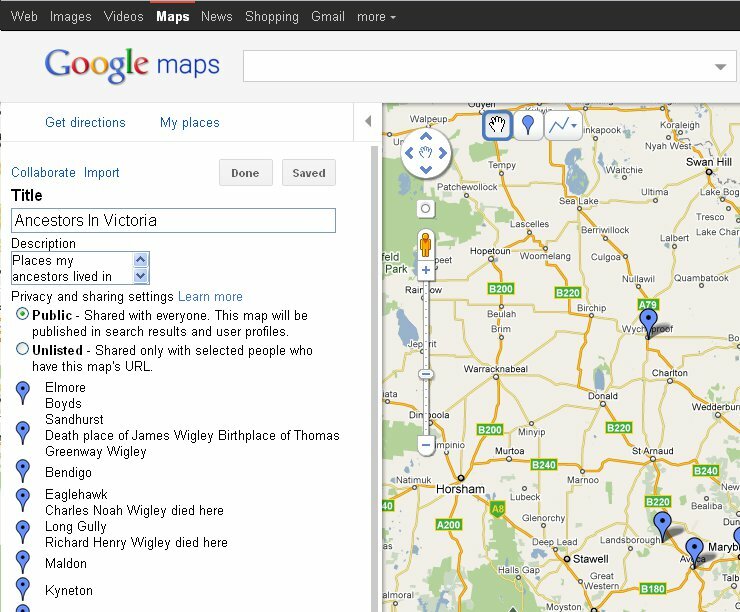 I have a map for ancestors living in Victoria, Australia. A lot of them were gold miners so the map shows me where on the Victorian goldfields they were living. It gives a ‘big picture’ to their lives and helps me to determine if a record I’ve found is for that particular ancestor or not. The maps I make are public so that other people can use them and contact me if we have any ancestors in common. Recently two family members were arguing about how to get to their grandparents property. After we drove there and worked out the route, I made a google map for future reference. Shouldn't be an issue ever again. Good idea Sharon, I use it for finding my way around Adelaide too.